Emanuel said the tentative agreement "invested in strengthening the classroom and helped our teachers financially, but actually did it in a way that CPS is on a better sustainable path than every contract preceding." The union got many of the things it wanted, including the continuation of the district paying the bulk of pension contributions for current teachers. CTU Vice President Jesse Sharkey praised the pay raises and job guarantees teachers would see under the tentative agreement. To finance the deal for this year alone, Emanuel tapped nearly $90 million in tax increment financing district surplus, even though he had for months dismissed the idea of using TIF money to shore up the school district's shaky finances. On Tuesday, though, he called using those funds "the right thing to do." Emanuel said the tentative agreement "invested in strengthening the classroom and helped our teachers financially, but actually did it in a way that CPS is on a better sustainable path than every contract preceding." The union got many of the things it wanted, including the continuation of the district paying the bulk of pension contributions for current teachers. CTU Vice President Jesse Sharkey praised the pay raises and job guarantees teachers would see under the tentative agreement. "I think that we achieved really most of our bargaining objectives," Sharkey said Tuesday. "And the things which we didn't achieve largely have to do with not getting some of the things that we aspired to." Chicago Public Schools officials say the district would save $300 million over the life of the four-year contract. But a spokeswoman could not provide an accounting for that figure. An eight-page summary of the tentative agreement, which covers July 1, 2015, to June 30, 2019, indicates some uncertain financial consequences of the pending contract. Veteran union members can qualify for a hefty cash bonus if they resign or retire by next summer. That would allow the district to replace higher-salary employees with younger and less expensive workers. But that provision won't kick in for teachers unless at least 1,500 of them retire. The retirement bonus option could raise some immediate expenses for the district. Teachers would receive a one-time bonus that pays $1,500 for each year of service. That means a teacher with 25 years experience would see a $37,500 payout that wouldn't affect their pension earnings. Paraprofessionals with at least a decade of service would be eligible for a similar deal, if at least 600 of them resign by June. CTU represents nearly 30,000 teachers and educational support personnel. 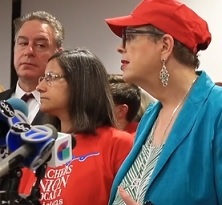 CTU's current membership will continue to have 7 percentage points of their required pension contributions paid for by the district, but a future generation of teachers — those hired Jan. 1 and after — won't receive the lucrative perk. In return, those new hires will get pay boosts that even out the loss of the pension pickup. Teachers won't get cost of living raises for the first two years of the contract, with pay hikes of 2 percent and 2.5 percent in the final two years. Raises based on experience and education would be part of the contract's final three years. Members will start paying higher health insurance costs in 2019. Absent from Monday's agreement is language from a January proposal from the city that barred the district from laying off teachers to save money. A deal on teacher layoffs was one of the last aspects of the contract agreed to on Monday, Sharkey said. Most tenured teachers who are laid off at the end of a school year would be eligible to fill temporarily vacant positions in 10 month stints. If no such vacancies exist, the teacher would be able to substitute teach for 10 months while earning full pay and benefits. The district's $5.4 billion operating budget assumed savings of $31 million through renegotiated contracts with unions including the CTU. That budget also assumed it would take in $32.5 million from TIF districts, but that figure would now increase to $87.5 million. "It does not appear that they are going to get that savings, although the (TIF) surplus that they have declared will help pay for some of it," said Laurence Msall, head of the nonpartisan Civic Federation budget watchdog group. The mayor agreed to increase the amount taken from those funds, which are used at city discretion to boost economic development — to $175 million from the originally proposed $60 million. About half of the money declared as "surplus" is going to CPS. That amount is larger than any the mayor has agreed to since taking office in 2011, and it presents a contrast to what Emanuel has been saying in recent weeks when asked if declaring larger TIF surpluses — something the CTU has long sought — could lead to a teachers' contract agreement. The mayor repeatedly described a larger TIF surplus as a one-time revenue source and not a long-term solution, even though the amount of money going into those funds not dedicated to specific projects grew significantly this year and is expected to remain at higher levels for years to come, barring a severe economic downturn. On Tuesday, with negotiations complete and his last minute gambit to avoid a strike successful, Emanuel made a different case to the Tribune editorial board. "Every year, I've surplussed," the mayor said, noting his policy of declaring 25 percent of TIF revenue not dedicated to projects as surplus. "So it's not new. It's part of a pattern." "I don't have a problem with what we've done," Emanuel said. "I know it's the right thing to do." The union would see one of its biggest victories in negotiations start to take shape in the second semester of the 2016-17 school year. That's when kindergarten through second grade teachers with 32 or more students in their classrooms become eligible to receive an assistant to help with instruction, according to the tentative deal. Sharkey estimated that agreement would cost about $10 million a year. In the end, CPS might not have to depend on TIF surplus funds as heavily in coming years, said Carole Brown, the city's chief financial officer. Costs are higher in 2017 under the new contract because of planned buyouts of longtime teachers. Salaries paid to their replacements will be lower, and they will pick up the full cost of their required pension contributions, she said. Msall said he wanted more details on how the early retirement system would work. "In this case, definitely, the new teachers who are replacing them are going to be paying more to the pensions," he said. "They are going to see a lesser pension benefit than existing employees, but we have to see the value of the lump sum that is being added before we can make a determination of how much savings or costs are associated." The union's House of Delegates are set to weigh in on the deal next week, Sharkey said. The contract has to be approved by the delegates and then voted on by full membership before a final deal is signed.